On the 1 September the Office for National Statistics produced its latest figures mapping the increase in life expectancy for men and women in England and Wales. 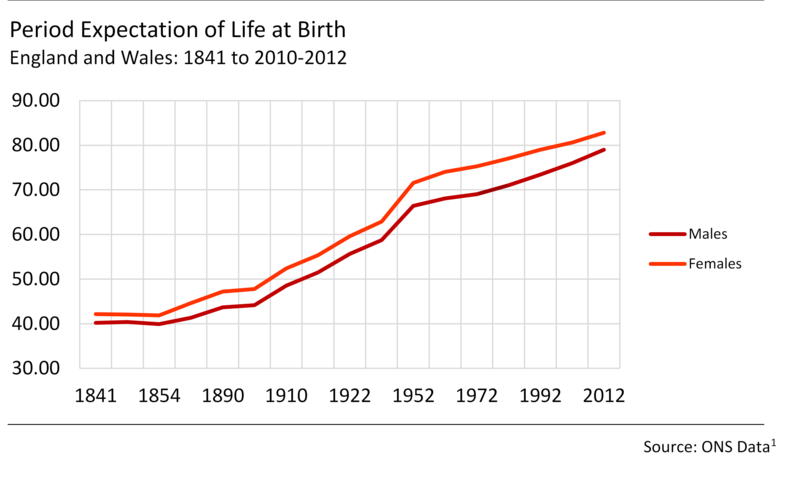 The figures, which map the progression of life expectancy between 1841 and 2012, captured the interest of the national press, leading to a number of stories reporting the upward trend and speculating on its significance. In at least two incidences, national papers commented on the significance of life expectancy rising despite historical upward trends in diabetes and obesity which, they argued, would be expected to undermine this increase in life span. Whilst the press are not necessarily wrong in identifying this contradiction, it is useful to reflect upon the fact that the significance of such correlations are rarely as simple as suggested. Whilst it is true that obesity and diabetes are increasing alongside life expectancy, it does not necessarily follow that the two trends always work against one another. Type two diabetes for example, the prevalence of which is rising particularly fast, is to an extent a product of old age rather than an obstacle to it. The National Health Service specifically recognises age amongst the causes of type 2 diabetes because of the impact it has upon the faculties and mobility of older people, reducing their ability to exercise effectively and consume a balanced diet. In 2012, within Europe as a whole, over 60s account for 54% of the diabetic population. By 2030, this is estimated to increase to over 60%, and will be seen alongside increases in the absolute numbers of diabetics and the proportion of adults with diabetes. Whilst rises in obesity and diabetes in younger sections of society should be expected to impact upon life expectancy trends, the overall figures on disability and diabetes are to an extent inflated by the phenomenon of increasing life expectancy itself. As people get older, we can expect to see the prevalence of obesity, and especially diabetes, increase. As such we should be careful to continue acknowledging the complexity of the relationship between disease and age in analyses of these trends. It will be crucial to meeting our future challenges.